Vero Beach Outlets in Vero Beach, Florida, has a broad selection of more than 55 leading designer and brand name stores. Shoppers can enjoy up to 65 percent off regular retail prices, and even more savings more during special store and mall events. Key stores include Banana Republic Factory Store, Gap Outlet, Coach Outlet, J.Crew Factory Store, Polo Ralph Lauren Factory Store, Nike Factory Store, Restoration Hardware Outlet, and Williams-Sonoma Outlet. Shoppers can visit the in-store sales events page on the Vero Beach Outlets website to see the extra savings events in the individual stores. Also, there are several mall and store events that are held throughout the year when shoppers can receive additional savings and often free gifts with their purchases. When you make a purchase, be sure to check your receipt. At times, there are cross promotion events, so when you make a purchase in one store, you receive additional savings at another store. The Vero Beach Outlets Facebook page is also a good source for promotions happening inside the stores, but don't expect to get your questions answered. The page appears mainly to promote sales, not engage with shoppers. 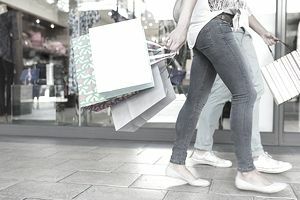 Key holidays when the majority of stores participate with some kind of extra savings event include Black Friday, Thanksgiving Weekend, Labor Day, July 4th, Mother's Day, and Veterans Day. Check store hours. The outlet has a tendency to close early (6 pm) on some holidays. Located right off I-95 at exit 147, Vero Beach Outlets is an easy stop if you happen to be in the area or traveling on I-95. I was there on a Saturday. It was easy to pull off the highway and there were plenty of good parking spots available. This is an outdoor center that is nicely designed (although somewhat dated), super clean, with average size stores throughout. Because it is an outdoor outlet mall, be sure to bring an umbrella, regardless of the weather report. Flash storms are common and unless you have time to shop in stores until the rain blows through, you could get drenched going to your car if you do not come prepared. There is ample seating around the center and tables with umbrellas. There is also a nice water feature near Banana Republic that helps create a cooling effect on hot days. For shoppers that would rather ride than walk, there is a shuttle available daily. This was a nice feature and something you do not usually find in the mid-sized outlet malls. There were around 45 stores when I was there and the selection of stores includes some of my favorites like Ann Taylor Factory Store, Columbia, Dooney & Bourke Factory Store, Restoration Hardware Outlet (which I rarely find at other outlets) and Williams-Sonoma Outlet. Prices in the stores were typical of what can be found at most outlet centers. I found some incredible deals at Columbia. The stores that I visited had good selections in both styles and sizes, which made my shopping experience even more enjoyable. Of course, like all outlets, selection is hit and miss. I just happened to "hit it" the day I was at Vero Beach Outlets. For extra savings, I took the time to go online and join the VIP Savings Club, which allowed me to print a voucher for a free savings book. That didn't really pan out, however. I ended up not using any of the coupons because most of the discounts were for regular priced merchandise and I was finding better deals by shopping the sale items. There is no food court, but there is a Subway and while I was there I saw a food truck, so the center is making an effort to accommodate hungry shoppers. Restrooms, although very clean, are few and far between, so plan accordingly. Die-hard outlet shoppers who want a huge variety of stores to shop and a great food court would likely be disappointed with Vero Beach Outlets, but for those who want to avoid big crowds and like quality over quantity, this outlet is a good choice. The next time I am near the area, I will stop and shop there again. Restoration Hardware Outlet - EXPANDING! For the most current store listing and additional outlet information, visit the Vero Beach Outlets website.